This is a haunting saga, brilliantly told, about the 1985 crash of a Japan Airlines flight in the mountains of remote Gunma that claimed 521 lives. It is a gripping tale that explores what happened and why while probing the human tragedies that have unfolded since that fateful day. At the footer of each page is a running list of the names and ages of the victims, a constant reminder of the people whose lives ended in the twilight of Aug. 12 as the plane spun out of control despite the pilots’ desperate efforts. Christopher Hood also draws our attention to some of the larger lessons of the crash, suggesting parallels to subsequent flawed disaster responses. 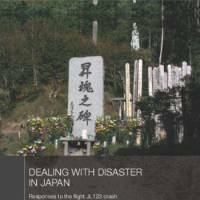 While disaster buffs will find this a rewarding read, I think that anyone interested in Japan will learn a great deal about how people collectively and individually cope with death, from how it is reported, how it is mourned and commemorated, to efforts at healing the traumatic aftershocks that disrupt lives and families, and the cold calculus of compensation. 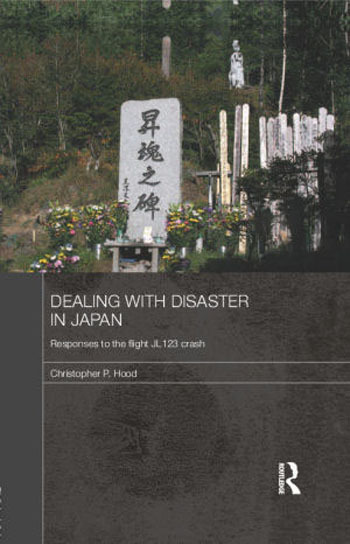 DEALING WITH DISASTER IN JAPAN: Responses to the Flight JL 123 Crash, by Christopher P. Hood. Routledge, 2011. 266 pp. $155. There are various theories about why the crash occurred, but it appears that the main factor was a faulty repair in 1978 of a rear bulkhead that had been damaged in a bad landing. Investigators believe that over time the repairs to this rear bulkhead of this workhorse Boeing 747, including a welded section, weakened and on JL 123 pressurized air from the cabin blew through a hole that developed in this bulkhead into the rear tail section, causing the rear stabilizer to break off and severing the hydraulic pipes. The loss of hydraulics was catastrophic, leading to the pilots’ losing control of the airplane. Between the rupture in the bulkhead and the crash into a mountainside, 32 minutes elapsed when passengers knew this was a serious emergency as the plane rolled and dipped upwards and downwards and they donned oxygen masks. A few passengers wrote down their last thoughts, one took photographs in the cabin that were later recovered while the four survivors recounted a terrifying ordeal in those final minutes. We also read chilling excerpts from the cockpit recorder as the pilots tried to regain control. Hood sifts through the various records and accounts, and is scathing about the crash investigators’ final report because it seemed geared to proving the already established theory about the faulty bulkhead repairs rather than thoroughly considering alternative possibilities. Apparently Boeing stood to gain from pinning the crash on the shoddy repairs unique to JL 123 rather than design defects that might have grounded the global fleet of six hundred 747s. Hood argues that three basic design flaws in the Boeing 747, subsequently rectified, caused the crash. The pilots might have landed safely if there had been a valve (now installed) that would prevent loss of all hydraulics in the case of damage to the piping. Hood considers various witnesses and theories, pointing out inconsistencies and improbabilities, but cites one anonymous source he apparently finds credible who told him cryptically that the passengers were murdered, but his side of the story won’t be released until he dies. The other question that has puzzled people over the years is the extraordinarily slow search and rescue response (SAR). Rescue teams did not reach the crash site until more than 15 hours after the crash of a plane that was being tracked on radar with an activated emergency transponder. More damning, soon after the 6:56 p.m. crash, a U.S. military plane that had been monitoring JL123’s progress diverted to the crash site and directed a U.S. helicopter to it within the first hour. The crew was preparing to winch men down to look for survivors but, “… was ordered to withdraw and return to base as the Japanese rescue team was on the way.” Two hours after the crash, media helicopters also reached the site so the precise location was known and accessible at least by air. The Asahi helicopter returned to confirm the site at 11:35 p.m. on the Aug. 12, but it was not until about 5 a.m. the next morning that Japanese authorities found the crash site, and it took another five hours for SAR teams to reach it, 15 hours after the crash. The author notes that the crash site is in a remote part of mountainous Gunma and difficult to access by land given the lack of roads, difficult terrain and the lack of visibility at night. After finding the four survivors, it took a further 90 minutes to transport medical personnel to the site and another hour to evacuate and dispatch them to hospitals. The survivors recall hearing and talking with others who survived the crash, but not the glacial emergency response. There is much more in this excellent book about personal devastation, about rituals of honoring the dead and the annual pilgrimage that help convey a sense of what JL 123 means to the bereaved relatives and how the crash has become embedded into social memory. Jeff Kingston is director of Asian Studies, Temple University Japan.